Everett’s Gabby Bulger, left, defends Northern Bedford’s Denae Hershberger during the fourth quarter, Thursday. Northern Bedford's Madison Cottle looks to pass the ball durin the first half against Everett, Thursday. Everett’s Kristen Ewing, back, looks for a steal against Northern Bedford’s Madison Cottle during the second half, Thursday. Northern Bedford's Allie Snider, front, looks to keep the ball away from Everett's Ashlyn Hicks during Thursday's game at NBC. Northern Bedford's Taylor Nycum surveys the court during the first half, Thursday. LOYSBURG — Everett powered past Northern Bedford, 58-12, Thursday. Everett’s Madison Hicks finished the game with a double-double. She scored 16 points and added 10 rebounds and four assists. Kaitlyn Maxwell led the Lady Warriors with 22 points, chipping in seven assists and six steals. The Lady Warriors opened with a 21-2 run in the first quarter. Kaitlyn Maxwell had 11 points, while Madison Hicks added eight. The Lady Warriors continued to dominate as the second quarter continued. In a run that began in the first quarter, Everett used a 15 straight points to jump ahead 34-5 at the half. The rally was highlighted by a pair of three-pointers by Brooke Colledge. Scoring for Northern Bedford in the first half were Madison Johnson, Makayla Kochara, and Ariel Reed. Reed went 1 for 2 at the line, while the other two had field goals. Hicks opened the second half with a basket to which Northern Bedford’s Cameron Pressel answered with a lay-up. From there, Everett finished out the third quarter with a 20-point run. Gabby Bulger paced Everett with eight points during the stretch, while Maxwell added six. Maxwell tallied the only points for the Lady Warriors in the fourth quarter. She scored on a lay-up after Pressel scored a free throw. 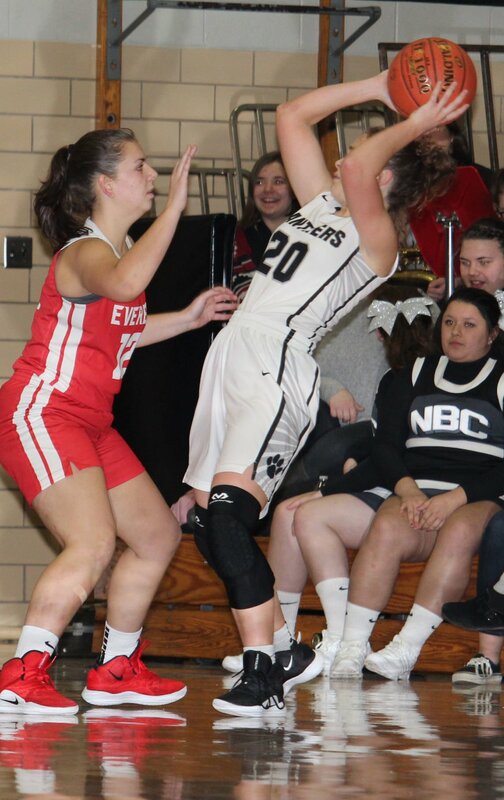 Allie Snider converted on a pair of free throws, while Denae Hersheberger scored a jumper, as the Lady Warriors topped the Lady Black Panthers, 58-12. “I thought Gabby Bulger shot the ball well tonight,” Moyer added. “We’ve been waiting on her to get on a roll and start knocking down threes. This is now two games that she’s done this for us. Northern Bedford hosts Fannett-Metal on Monday, while the Lady Warriors visit Forbes Road. Everett (58) — Lizzy Jay 0 0-2 0; Brooke Colledge (2) 0 0-0 6; Kristen Ewing 3 0-0 6; Annie Nave 0 0-0 0; Gabby Bulger (2) 1 0-2 8; Madison Hicks 7 2-2 16; Kaitlyn Maxwell (1) 7 5-6 22; Alex Iseminger 0 0-0 0; Lainie Treece 0 0-0 0; Lilly Mills 0 0-0 0; Ashlyn Hicks 0 0-0 0; Rebekah Mills 0 0-0 0. Totals: (5) 18 7-12 58. Northern Bedford (12) — Madison Cottle 0 0-0 0; Cameron Pressel 1 1-2 3; Ariel Reed 0 1-2 1; Denae Hershberger 1 0-0 3; Madison Johnson 1 0-0 2; Sarah Heck 0 0-0 0; Allie Snider 0 2-2 2; Taylor Nycum 0 0-0 0; Makayla Kochara 1 0-0 2; Olivia Higgins 0 0-0 0; Reia Finnegan 0 0-0 0; Jayden Skillings 0 0-0 0; Maja Knutzen 0 0-0 0. Totals: 4 4-6 12. JV — Everett, 33-18. High Scorers — E: R. Mills, 7; NB: Snider and Kochara, 7. THREE SPRINGS — The Tussey Mountain girls basketball team topped Southern Huntingdon, 51-26, Thursday. Both Meghan Molosky and Sophie Brumbaugh led the locals with 16 points, while Lexi Weimert added 11. Tussey Mountain visits McConnellsburg on Monday. Tussey Mountain (51) — Lexi Weimert 5 1-4 11; Sophie Brumbaugh 6 4-7 16; Kailee Leonard 0 4-6 4; Maddie Garner 0 2-2 2; Abbie Weaver 0 0-0 0; Andrea Hafer 0 0-0 0; Katie Hoover 0 0-0 0; Haylie Taylor 1 0-0 2; Meghan Molosky (1) 5 3-3 16; Keirsten Park 0 0-0 0. Totals: (1) 17 14-23 51. Southern Huntingdon (26) — Jenny Cantrell 7 2-4 16; Hannah Hunsinger 0 0-0 0; Olivia Wilson 1 2-2 4; Emily Greenland 0 0-0 0; Mykia Garner 0 4-7 4; Jocie Whitsel 1 0-2 2; Carlee Leidy 0 0-0 0; Saige McClure 0 0-0 0. Totals: 9 8-15 26. JV — Southern Huntingdon, 27-21. High Scorers — TM: Taylor, 7; SH: McClure, 9.